This month, in between updates to Sandvox, we’re doing a special promotion for Sandvox that is being made available exclusively to you, the members of our email alert list, and your friends. We’ve never done anything like this before (and we might not again for a long time) so pay attention! Starting tomorrow, Wednesday August 12 at 8:00 AM (California time), for 48 hours, licenses to Sandvox will be discounted to 50% off if you use our special coupon code. This includes new licenses — not upgrades, sorry — to both the Regular and the Pro edition. Pick a single-user or household license. The sale will last only until 8:00 AM, Friday, August 14 (California time). The coupon code is: “TELL A FRIEND” in our online store. What’s in it for you? You can be a hero to your friends who may be struggling with the idea of building a website. A personal recommendation may be just what they need. Or, maybe you have been putting off getting a license for yourself; now’s a great time! You can tell your friends about the coupon code, or you can use it for yourself. Or both! You can even mention the sale online (Twitter, Facebook, etc.) but if you do, please be sure to mention that the discount is only going on for a short time, and, more importantly, please help educate others about why Sandvox is such a useful tool for building a website. You can direct your friends to our Sandvox website, and you can also give them the Sandvox “electronic referral kit” that we’ve created for this occasion. Or, just forward this email along with your personal notes, since it has the URLs they’ll need. If you follow us on Twitter, you probably noticed last month that our hosting partner A2 had a month-long sale, 40% off. Well, they are doing it again for August. Their “Startup” plan is an amazing, low-cost bargain if you are just getting underway in building a website, and their “Executive” plan is a tremendous deal. Use the code “rerun” at their website. Naturally, the friends you are recommending Sandvox to might find the A2 promotion useful, so feel free to pass this information along as well. Your Experiences in Search Engine Placement & Traffic? A few months ago, we started sending out suggestions for getting more visitors to your Sandvox-built websites, including step-by-step how-to lists, a link to a PDF eBook on building Traffic, links to SEO power-house StomperNet with their free “Seven Deadly Sins” email course and $1 “Stomping the Search Engines” video course (which we ourselves have found very useful). We’d like to continue to offer more help, but we’re looking for your input. Have you tried out the suggestions and resources we’ve given? How have they worked for you? Are there other topics you’d like to see covered? Please reply to this email with your comments. From time to time we like to give a shout-out to cool applications on the Mac. 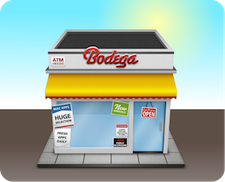 This time around, we wanted you to know about a free application called Bodega that just launched. It’s like an App Store for the Mac, introducing you to quality software designed by independent Mac developers. Download this free application and give it a try. You’ll probably discover a lot of great software that you hadn’t known about! Incidentally, we are hoping to expand the listings for our applications in Bodega. If you have a few minutes after you have downloaded it and you don’t mind writing a quick review of Sandvox [Open in Bodega] and/or iMedia Browser [Open in Bodega], or giving them some ★s, please do! We’d really appreciate it! Don’t forget: The Sandvox Sale starts in less than 16 hours. Tell your friends: If you’ve waited to jump in and start creating your own website, now’s the time to try!